Today is our 20th anniversary! Wow, I couldn't have imagined this fantastic ride 20 years ago if I tried. We were so young, just 2 weeks after college graduation, but we met in high school so had been together for 6 years before getting married. Then, we had 7 years as a couple before the kids came along. 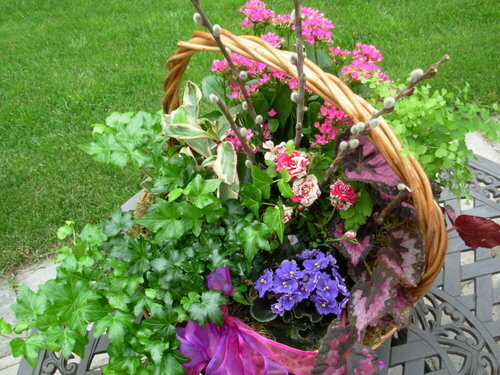 Today Mark is away on a trip, but he had this beautiful basket sent this afternoon while the kids and I were in town. 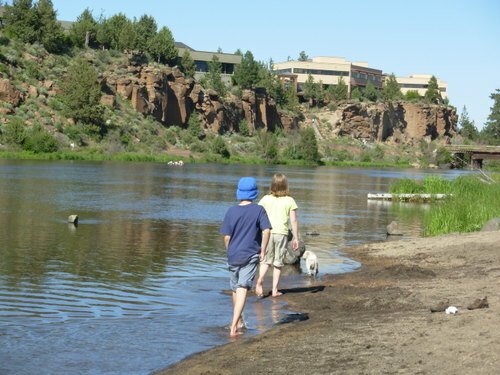 Now, 4 states, 11 houses and 2 kids later we are living our dreams in Oregon! 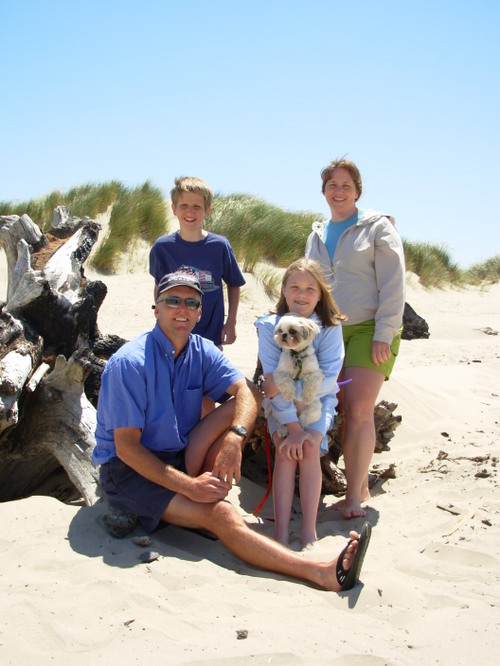 Here we all are on the beach in Florence, OR last Sunday. Happy Anniversary, Sweetie! 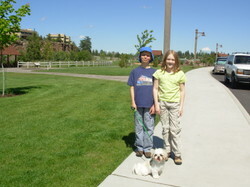 Our weekend trip was wonderful, busy and very warm! 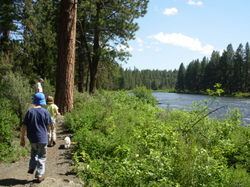 We camped just outside Eugene so I could attend the Black Sheep Gathering. I did make it for a few hours on Saturday. 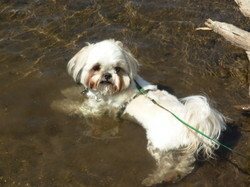 Luckily, it wasn't quite so hot that day and, with everything being inside, it was pretty comfortable. I got a good look at the critters. Isn't that baby alpaca the cutest! 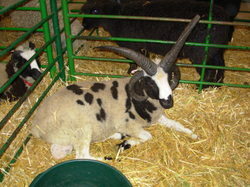 They had all just been shorn and looked so funny on their long, gangly legs. I also had a marvelous time in the marketplace. 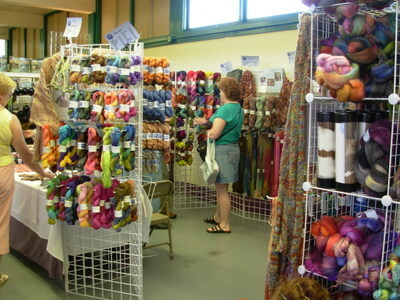 I took only one photo there, but it was the Blue Moon Fiber Arts (home of the Socks that Rock) booth, so I had to. I was worried about coming a day after the start of the festival and having BMFA completely wiped out, but I had plenty to choose from. Here are the spoils from that little shopping trip. I took the plunge and got myself a real hand spindle! 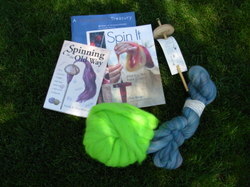 In addition, a few books for pointers, and some roving. The green one is Romney and the blue is Corriedale. I have tried spinning at a museum, but it's been a few years, so I'll need to do a lot of practice! 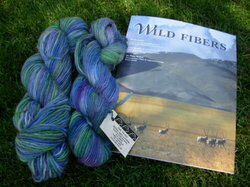 I also picked up some hand-dyed yarn (colorway Oregon Lakes, one is for my One Skein SP) and the current Wild Fibers Magazine. The magazine just looked really interesting. I'm not sure I'd need to subscribe, but I wanted to check it out. 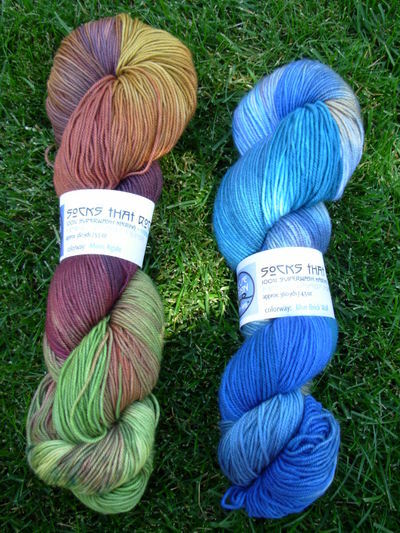 Finally, I managed to not go completely crazy at the BMFA booth, and came away with only two skeins of Socks that Rock. On the left is Moss Agate- mediumweight, on the right is Blue Brick Wall- lightweight. I got quite a bit of knitting done on the Lady Eleanor Scarf and a small bit of knitting on the Trekking socks. There are many more photos from this fabulous weekend that I will share in the days ahead. 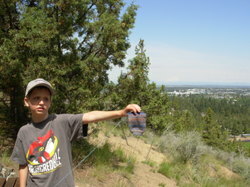 The Summer of Socks began yesterday, the first day of summer! It was a gorgeous day. We're definitely having a June to brag about. 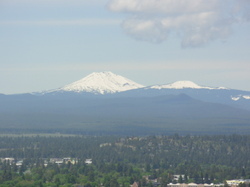 The weather is in the 70's with sun all day. 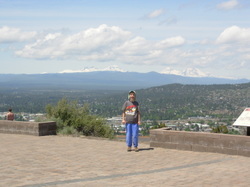 It's clear and beautiful as opposed to last June which was cold and rainy for just about the whole month. It's supposed to get up to the 90's by Sunday, but here in the high desert it still cools down at night, making sleeping very comfortable. Well, if you've tuned in for the knitting, here it is. I started my SOS socks last night. I'm using my Claudia's Handpainted Sock Yarn from my SP7 secret pal. It's in the Chocolate Cherries colorway. This yarn is fantastic to knit with, so soft and springy. 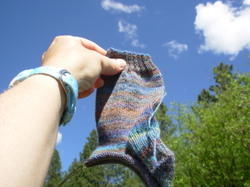 I'm going to give it a try with two socks on two circs. I've done this before, but only with a teaching pattern. I'm also doing them toe up. I've got two toes started and will do the foot in plain stockinette. I'm thinking about using a pattern from Knitting Vintage Socks for the leg. I also made a lot of progress with the Entrelac Bag. I'm working on finishing the flap, then I'll just have to knit the bottom and make some handles and it'll be ready to throw in the washer. 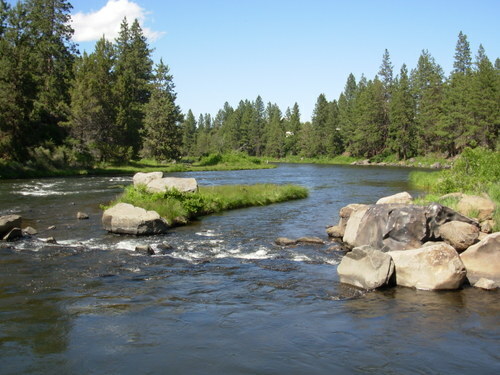 We are going camping this weekend in Eugune, OR and will take a day trip to the coast. 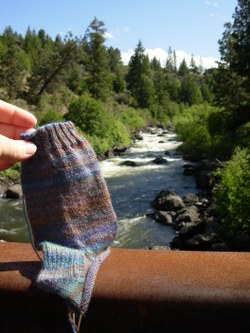 I'll be taking some knitting and will definitely have the trekking socks since I plan to do a coastal trek with them. 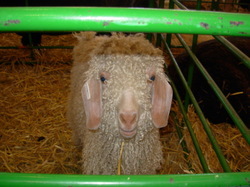 Oh, and the big reason for going is that I'll be attending the Black Sheep Gathering. 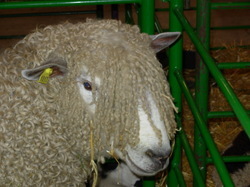 It's billed as the biggest wool show on the west coast. I can't wait to see it! If I don't post again before we leave, have a great weekend! I've got some new WIP's that I just had to show you. I'm in love with these for the colors and the technique which I've just learned. 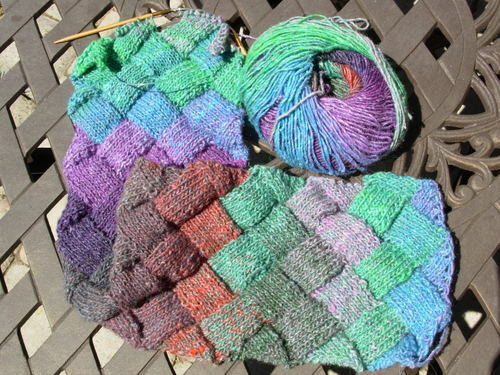 Entrelac is just amazing. I always thought it would be much harder than it is. Now I'm on the lookout for other Entrelac projects. I know I have one in one of my magazines, but I can't find it. Anyway, here's how it started. The Lady Eleanor Stole (from Scarf Style) which I'm making in a scarf size. 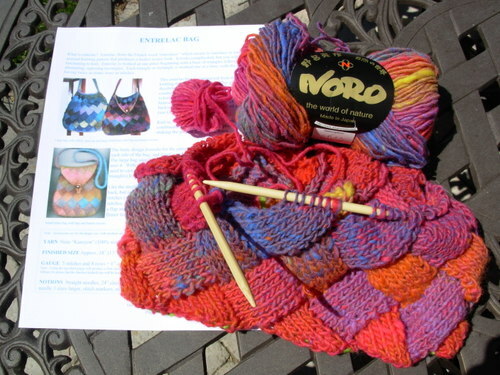 I'm knitting this with Noro Silk Garden Lite. I was at the LYS last week and saw this pattern for a felted Entrelac Kureyon bag and I had to give it a try. The entrelac directions are slightly different from those of Lady Eleanor, but I like to try various ways of doing the same thing. I'm making the small version which is the bottom photo. Lastly, I have jumped on the Mason-Dixon bandwagon by starting a little log cabin blanket. 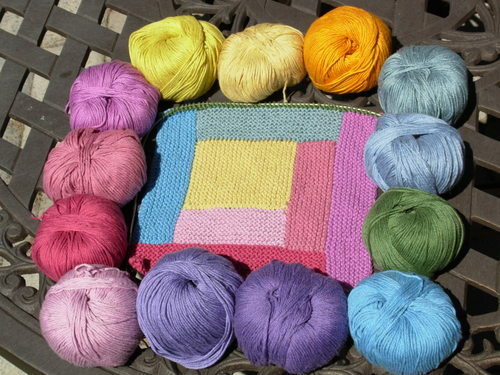 I have no intended recipient, but it would make a lovely baby blanket. It is made with a bunch of Rowan Cotton Glace I've had in my stash for a long time. They were intended for another project, a little fair isle kid's backpack. I started that project, but wasn't happy with the results. I think this is a much better use of the yarn. I did buy 5 more balls to go with the ones I already had, but I hope I won't need to buy any more, except for something to go around the finished edge. Okay, I admit theses are not my only WIP's! These are just the newest ones that haven't appeared on the blog before. 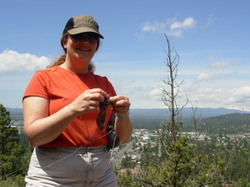 I'm still hand quilting the May PS quilt and I've still got a bunch of other knitting projects. Sometimes you have to take an idea and run with it just to keep the inspiration flowing. Long-overdue?? No, it's not that bad. 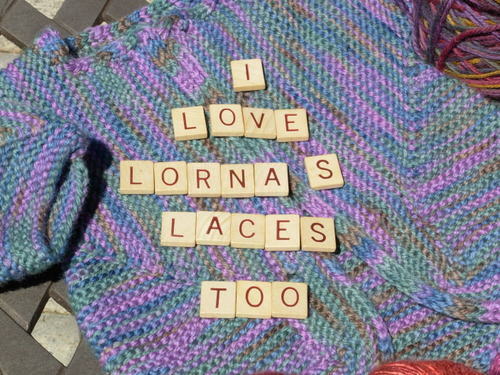 Actually, L is for Lorna's Laces! I love this yarn. I started with the shepherd worsted and then became obsessed with the sock yarn and have just moved up a notch to the Lion & Lamb! 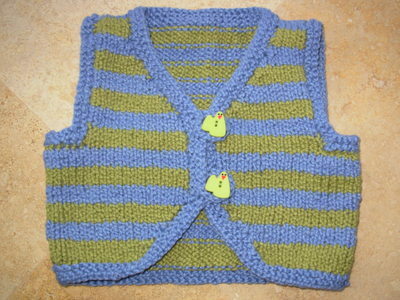 Here's Elizabeth Zimmermann's Baby Surprise sweater made with LL Shepherd Worsted. I think this is the perfect project for that yarn. The yarn is so soft and superwash, so it's good for babies. 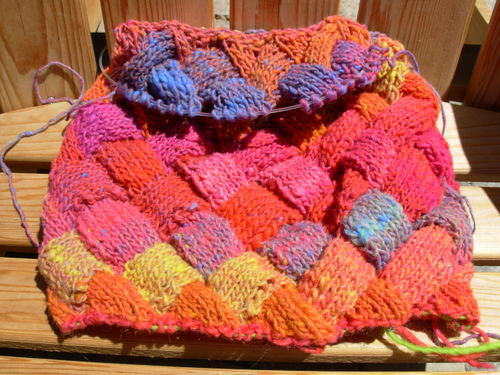 Also, the variegations work wonderfully because the sweater is knit as a sort of wonky rectangle. The colors in the yarn never get a chance to pool in some funny way. It just has these gorgeous variations. The four balls stacked up and the one in front of them are all Shepherd Worsted. I'm not sure what they'll become. Then there's all the sock yarn. My absolute favorite of these is the Gold Hill (fall colors) colorway, but they are all nice. 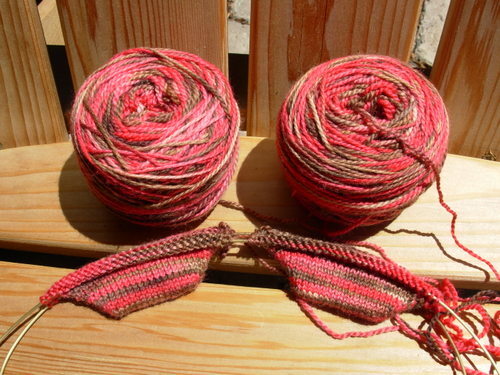 Lastly, still in the skein is the Lion & Lamb, destined to be Clapotis #3. I would say you can't go wrong with LL, so give it a try if you haven't yet! 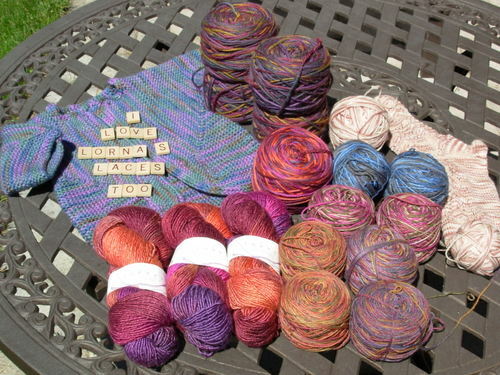 I have finished my 2006 Dulaan knitting and will be sending the box off today! 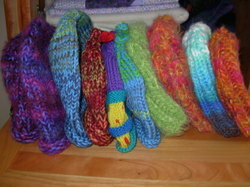 I managed to knit 9 hats of various sizes and a toddler sized sweater. The hats are made from all sorts of bits and pieces of leftover yarn. I also better tell you that the second from the right was actually knit by Chloe (to make 10 total hats). 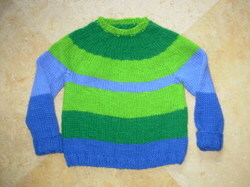 The sweater is made from Lamb's Pride worsted and it's the seamless yoke pattern from The Knitter's Handy Book of Sweater Patterns. A funny thing was that after all the knitting I realized that the lime green was being saved for a felted bag I'm about half way through! Oh well, I can use something else. I'm glad I tried out this pattern in a small size. I think I've decided that I don't like the seamless yoke style. I think I would prefer a raglan style for a seamless, knit in the round sweater. Here's another FO, not for Dulaan, but for Chloe's Spanish teacher who will be having a baby any week now. 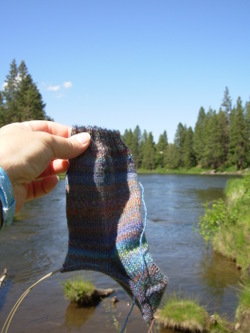 This is the Ziggy pattern from Mission Falls Wee Knits in Mission Falls 1824 Cotton, colors Sky and Wintergreen. I think the little chicken buttons are too cute. I bought a huge bunch of Mission Falls 1824 cotton last year without ever trying it. The two items I made with it was just about enough to kill my hands so I won't be knitting with this stuff ever again. I do love the finished fabric, but I can't stand to knit with it. I finally decided to post it on the Destash blog and get rid of it. There's still a bunch left in color Jade if you're interested! I've got so many posts rambling about in my head, but haven't had the chance to take photos for them. 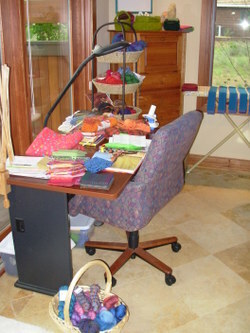 So, today I thought I'd join the gang and post a few photos of the piles in my sewing room. 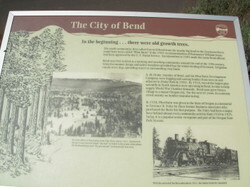 I took these photos last week. 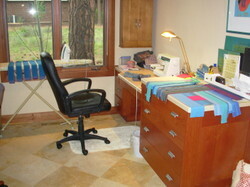 I love the color that is my sewing room! 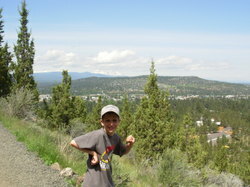 Speaking of color, check out the burst of colors on Jan's blog. On the left I've got quilt fabrics waiting for choices to be made, the red and pink Project Spectrum quilt awaiting the sewing on of the hanging sleeve, clapotis waiting for weaving in ends and blocking, a sock waiting to be finished, and my Kaffe Fassett book open to the page of the blue quilt I'm doing for Project Spectrum. On the right I've got the fabric strips laid out for the blue quilt and three (!) more socks in progress. So much potential! And today, it looks quite different. Meanwhile, I've got some more treks planned, an L post, an M post, a Dulaan update, and a couple of other FO's. More to come soon!